FX has ordered ten episodes of the single-camera comedy series “Baskets,” created by Zach Galifianakis, Louis C.K. and Jonathan Krisel. Filming on the series begins next year for an airing in 2016. “Hangover” star Galifianakis plays Chip Baskets, a Bakersfield man who pursues his dream, against all odds, to be a respected clown. But after an unsuccessful enrollment at a prestigious clowning school in Paris, the only job he can find is with the local rodeo. It’s a little on the small side, but FX has released the superb artwork for the upcoming fourth season of its “American Horror Story” anthology series. 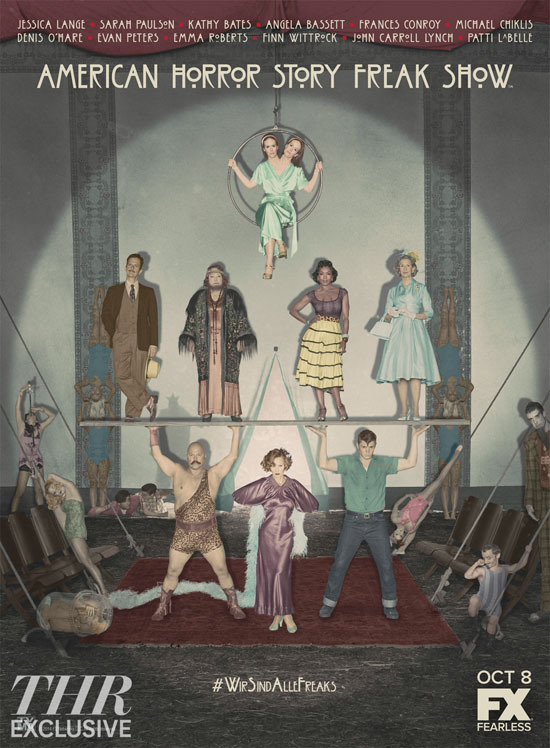 Details about the character circus troupe setting can be garnered from the work with Michael Chiklis as a classic strongman, Kathy Bates as a bearded lady, Even Peters as the classic 1950s greaser rebel, and of course Sarah Paulson as a woman with two heads.